I ended up buying eggplants last weekend at the Farmer’s Market (and some peppers and some tomatoes) for a quick-and-easy roasted ratatouille. Instead of the BBQ, though, I went with our oven. There are some gorgeous ratatouilles out there but I went for the random rustic effect. 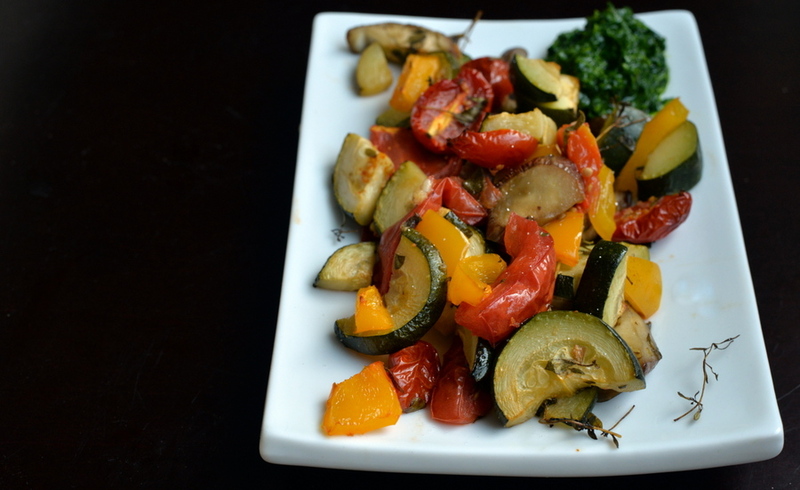 I liquored my vegetables with some white wine (as a nod to my French Farmhouse Grilled Zucchini) and tossed in handfuls of fresh herbs, namely thyme, oregano and marjoram. The roasted vegetables were simple and excellent. No bitter eggplant and a host of summer flavours. However, the best part was the basil pistou. A French version of pesto, it is made without cheese or pine nuts, it is a garlicky basil dressing at its finest. Despite all the basil used, it pulses down to next to nothing, so consider making extra for freezing. It disappeared quickly here. I am sharing this with Meat Free Mondays and this month’s Tea Time Treats. 2. Chop eggplant and place in a large bowl. Sprinkle with salt and let it rest at room temperature for at least 30 minutes. This will reduce the bitterness in the eggplant. Water will collect at the bottom of your bowl. Squeeze each individual piece of eggplant to remove any excess moisture. Rinse away any excess salt water. 3. To the large bowl, add the onion, zucchini, bell pepper, tomatoes and garlic. Stir in the fresh herbs, drizzle with white wine and oil and season with salt and pepper to taste. Stir to evenly combine. Place vegetables on a silpat-lined baking sheet and bake at 45 minutes, or until tender. Allow to cool slightly prior to serving still warm. 4. Meanwhile, make your basil pistou (see below). 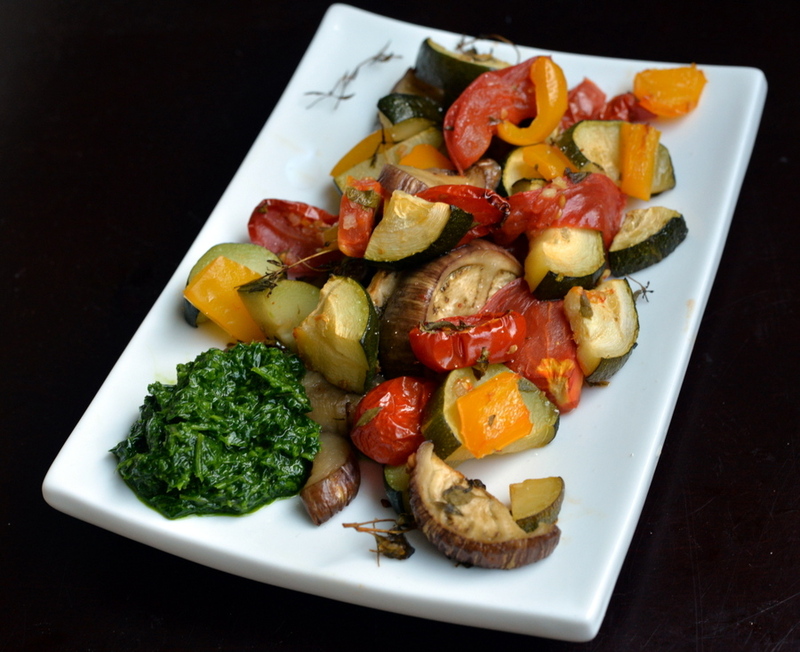 Serve pistou on the side, or mix into the roasted vegetables. 1. In a food processor, place the basil leaves, garlic, olive oil, and salt. Pulse until thoroughly blended, scraping down the sides as needed. Refrigerate until needed or freeze for long-term storage. So I’ve just come across your blog and I’m a HUGE fan- So many delicious recipes I’m salivating over! 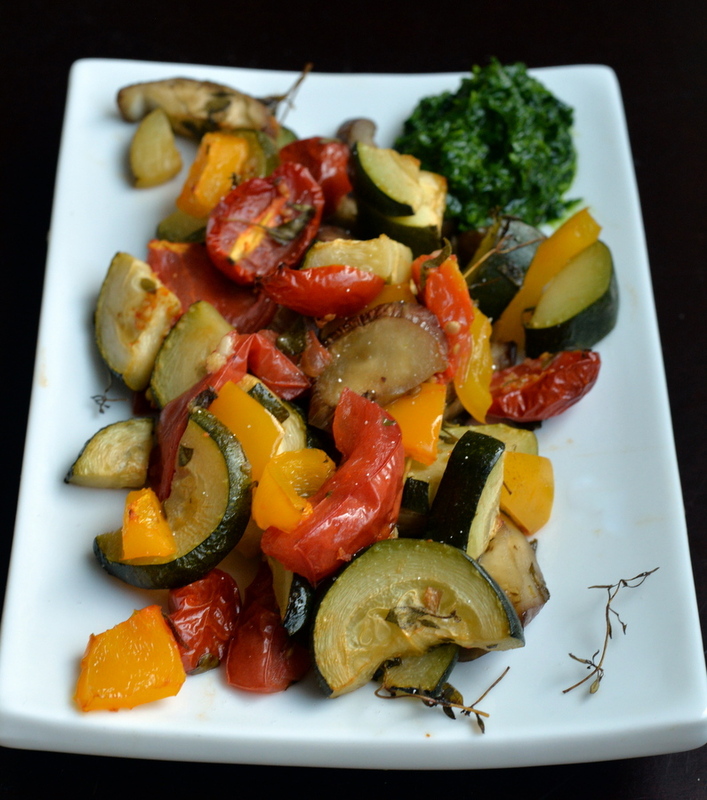 Ratatouille is without a doubt one of my all time favorite dishes and I’d eat the basil pistou with a spoon! Cannot wait to stalk your archives- I think I’ve found a new favorite blog! 🙂 Thanks Janet! This looks so tasty! 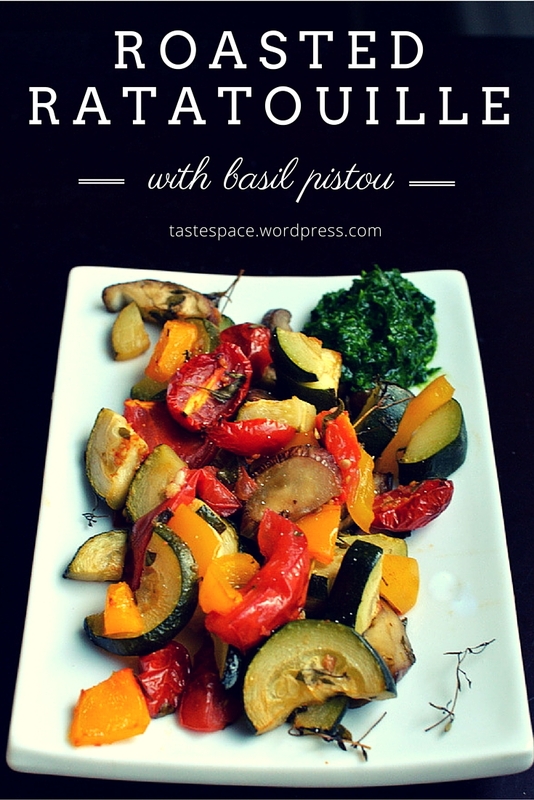 I love roasted veggies and I bet they’re amazing served with that basil pistou! Ooh good use of basil. I like the sound of this more than traditional pesto. And I’m not a huge eggplant person, up until recently I just downright didn’t like it. 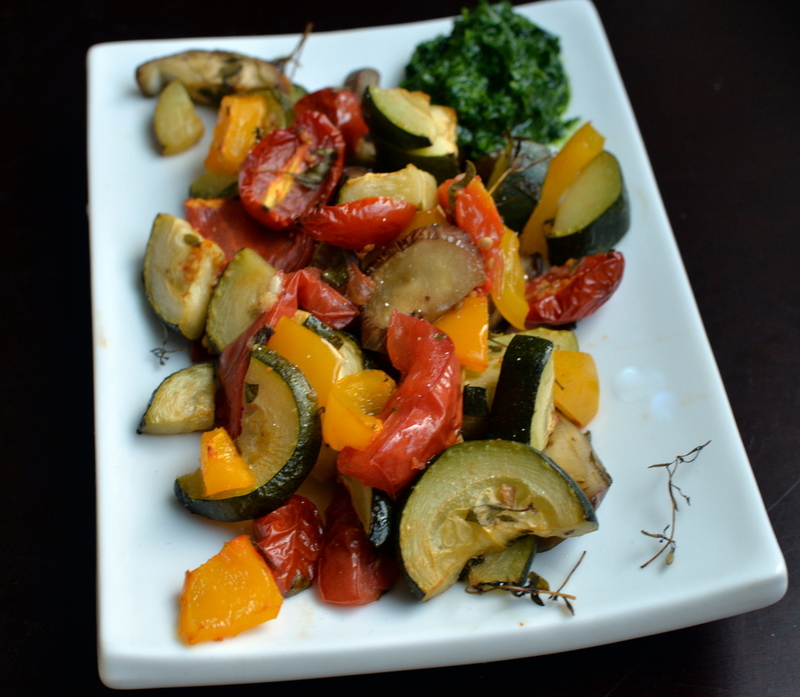 But I’m trying to eat it now and again and I bet I would like it in this delicious veggie-filled ratatouille.